The RCA Rt structured problem solving process is supported and delivered by SIRF Roundtables. To learn more about variety of our RCA Rt training courses, and how you may benefit by implementing, click here. QUESTION: I will be attending an RCA Rt training course and want to use the software to complete my accreditation exercises. How do I obtain my free access? ANSWER: Your RCA Rt instructor will provide you with log in details so that you may use the software for free for a period of time to allow you to complete your accreditation exercises. QUESTION: Can I change the number of users or the version od RCA2GO I use? ANSWER: You can change your subscription easily, and at any time. 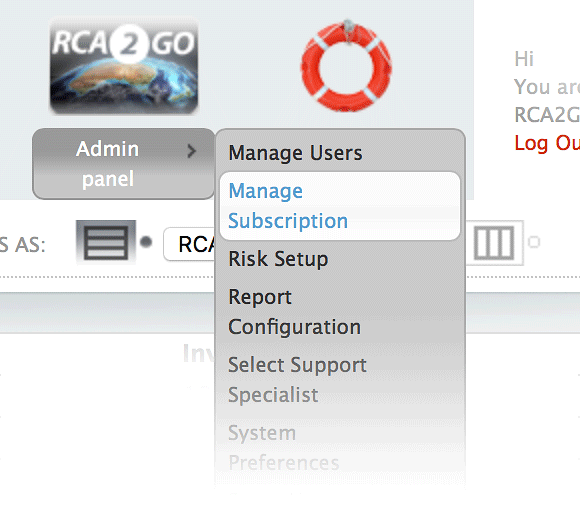 The system administrator for your site will see an Admin panel button on their RCA2GO screen. This button will provide access to a menu (see picture) and administrative option that allows the system administrator to change the number of users and software package to match the needs of the organisation. QUESTION: What purchasing dicounts are available? ANSWER: Discounts are available which can reduce the cost of software to a fraction of the normal cost. The following process is used to establish the discounted software cost. Firstly, the normal price is calculated based on the standard price for the version of software chosen. If the person purchasing the software is employed by a company which is a current member of SIRF Roundtables, then the sub total is discounted by a further 10%. This subtotal is also discounted by as much as 80% in recognition of the number of users that will be accessing the software. These calculations will be shown during the "Estimate" process. You can change ordering parameters (say, number of users) to get different estimates and print them out for comparison. The "Estimate" is calculated always in Australian dollars. How that reflects in your local currency that your credit card will be charged, will depend on exchange rates. BY COMPLETING THE ELECTRONIC ACCEPTANCE PROCESS AND CLICKING THE "SUBMIT" BUTTON, YOU REPRESENT AND WARRANT THAT YOU: (i) ARE AUTHORIZED TO SIGN FOR AND BIND THE CONTRACTING PARTY AND (ii) AGREE TO BE BOUND BY ALL OF THE TERMS AND CONDITIONS OF THIS AGREEMENT, INCLUDING THE DISCLAIMERS AND LIMITATIONS OF LIABILITY SET FORTH IN SECTIONS 9 AND 10 BELOW. NOTE: If you will use this software in Australia then the Australian Tax Office requires that you pay Goods and Services Tax (GST). It is therefore a requirement that if you are using this software in Australia that you select "Australia" as your country during the quotation process. RCA Rt allows individuals and organizations to document problems and the reasoning behind the problem solution and the appropriate countermeasure. To use the Product, You must submit a complete RCA Rt registration, which is available at www.rca2go.com (the "Registration Form") as part of the on-line purchase procedure . As part of the registration process for the Product, You agree to: (1) provide certain limited information about You as prompted to do so by the Product (such information is to be current, complete and accurate) and (2) maintain and update this information as required to keep it current, complete and accurate. The information requested on original signup shall be referred to as registration data ("Registration Data"). If RCA Rt Pty Ltd discovers that any of Your Registration Data is inaccurate, incomplete or not current, RCA Rt Pty Ltd may terminate Your right to access and receive the Product immediately upon notice. RCA Rt Pty Ltd will evaluate the registration application in good faith and will notify You in a timely manner regarding acceptance or rejection. RCA Rt Pty Ltd may reject a registration application if it determines in its sole discretion that the user is not an appropriate subscriber or user of the Product. RCA Rt Pty Ltd reserves the right to refuse the Service to any user who has cancelled any number of previous Service accounts. RCA Rt Pty Ltd need not provide a reason for its rejection. If RCA Rt Pty Ltd rejects Your application, then You may reapply and RCA Rt Pty Ltd will reconsider the application. You may not register for this Service if You are under 18 years of age. By registering for this Service You represent to RCA Rt Pty Ltd, that You are 18 years of age or older. Upon acceptance of this agreement and completion of the registration process You will have opened an account with RCA Rt Pty Ltd and will become a subscriber to the RCA Rt Service. (a) Description of Service. RCA Rt allows the registered user to document problems and the reasoning behind the problem solution and the appropriate countermeasure. RCA Rt Pty Ltd makes the RCA Rt Service available under a number of different subscription plans. Please confirm that the plan for which You are registering meets Your needs by reviewing the "product information pages." (b) Fees and Payments. You can find the current Subscription Fees and charges posted under the “Admin / Manage Subscription” button RCA2GO web site. (c) Trial Offers, Coupons, Credits and Special Offers. RCA Rt Pty Ltd reserves the right to discontinue or modify coupons, credits and special promotional offers at our discretion. We encourage the use of our service through free trials. To view the specific details regarding your free trial, if any, please visit your Admin / Manage Subscription web page within the software. The Free Trial offer associated with RCA Rt entitles new, registered subscribers to a one-time free trial usage of the service. Free Trial terms vary by promotional offer. (d) Subscription Renewals. You may renew your subscription to the RCA2GO software subscription by paying the annual fee in advance. You may renew the RCA Rt subscription on-line up to 12 months in advance. (e) Upgrade at any time. You may upgrade the version of software or the number of users at any time. You may be eligible for the “pay later option” when you upgrade the number of users. If you choose this option then you are making the firm commitment for pay for the upgraded license at the time of re-subscription. resell the use of the Product, any downloadable plug-in or other materials or any information obtained by You without the express written consent of RCA Rt Pty Ltd.
(b) Conduct. You are solely responsible for the content of Your transmissions through the Product. RCA Rt Pty Ltd does, however, reserve the right to take any action with respect to the Product that RCA Rt Pty Ltd deems necessary or appropriate in RCA Rt Pty Ltd's sole discretion if RCA Rt Pty Ltd believes You or Your transmissions or use of the Product may create liability for RCA Rt Pty Ltd. Your use of the Product is subject to all applicable local, state, national and international laws and regulations (including without limitation those governing account collection, export control, consumer protection, unfair competition, anti-discrimination or false advertising). You agree: (1) to comply with all Australian laws, rules and other regulations applicable in connection with the Product; (2) not to use the Product for illegal purposes; (3) not to interfere or disrupt networks connected to the Product; (4) not to use the Product to infringe any third party's copyright, patent, trademark, trade secret or other proprietary rights or rights of publicity or privacy; and (5) not to transmit through the Product, through Feedback or otherwise, any unlawful, harassing, libelous, abusive, threatening, harmful, vulgar, obscene or otherwise objectionable material of any kind or nature. You will not attempt to gain unauthorized access to other computer systems and You will not interfere with another user's use and enjoyment of the Product. (c) Proprietary Rights. In accordance with Your authorized use of the Product, RCA Rt Pty Ltd grants You a limited license to use the software solely in connection with the Product offered by RCA Rt Pty Ltd. You acknowledge that the plug-in downloaded in connection with the Product is proprietary to RCA Rt Pty Ltd and may be protected by copyrights, trademarks, product marks, patents or other proprietary rights and laws; therefore, You are only permitted to use this plug-in as expressly authorized by the Product and these Terms. Further, RCA Rt, RCA Rt Pty Ltd and the RCA Rt Pty Ltd and RCA2GO logo, and other names, logos, icons and marks identifying RCA Rt Pty Ltd's products and services are trademarks of RCA Rt Pty Ltd and may not be used without the prior written permission of RCA Rt Pty Ltd. You may not copy, reproduce, distribute, lease, loan, rent, timeshare, deliver or otherwise transfer, directly or indirectly, the Software license granted to You (in whole or in part) or create derivative works of this plug-in without expressly being authorized to do so by RCA Rt Pty Ltd. If You are not the purchaser of the software license from RCA Rt Pty Ltd, you are not authorized to install or otherwise use the software or services to host meetings. Further, You may not reverse engineer, decompile, alter, modify, disassemble or otherwise attempt to derive source code from the plug-in. All rights not expressly granted in these Terms are reserved to RCA Rt Pty Ltd.
As part of the registration process, You will use Your email address as Your user name and You will choose Your passwords for access to this account and to your designated computers. You agree to carefully safeguard all of Your passwords. You are solely responsible if You do not maintain the confidentiality of passwords and account information. Furthermore, You are solely responsible for any and all activities that occur under Your account. You agree to immediately notify RCA Rt Pty Ltd of any unauthorized use of Your account or any other breach of security known to You, including if You believe that its password or account information has been stolen or otherwise compromised. RCA Rt Pty Ltd may immediately terminate Your membership and right to use the Product if (a) You breach these Terms; (b) RCA Rt Pty Ltd is unable to verify or authenticate any information You provide to RCA Rt Pty Ltd; (c) such information is inaccurate; or (d) RCA Rt Pty Ltd decides, in its sole discretion, to discontinue offering the Product. RCA Rt Pty Ltd shall not be liable to You or any third party for termination of the Product. You may terminate this agreement with or without cause at any time, effective immediately upon written notice to RCA Rt Pty Ltd. Should You object to any terms and conditions of the Terms or any subsequent modifications thereto or become dissatisfied with the Product in any way, Your sole recourse is to immediately: (a) discontinue use of the Product; (b) terminate your membership; and (c) notify RCA Rt Pty Ltd of termination. Upon termination of membership, Your right to use the Product immediately ceases. YOU EXPRESSLY AGREE THAT USE OF THE SERVICE IS AT YOUR SOLE RISK. THE SERVICE IS PROVIDED ON AN "AS IS" BASIS. RCA RT PTY LTD EXPRESSLY DISCLAIMS ALL WARRANTIES OF ANY KIND, WHETHER EXPRESS OR IMPLIED, INCLUDING, BUT NOT LIMITED TO, THE IMPLIED WARRANTIES OF MERCHANTABILITY, FITNESS FOR A PARTICULAR PURPOSE AND NON-INFRINGEMENT. RCA RT PTY LTD MAKES NO WARRANTY THAT THE SERVICE WILL MEET YOUR REQUIREMENTS OR THAT THE SERVICE WILL BE UNINTERRUPTED, TIMELY OR ERROR FREE, NOR DOES RCA RT PTY LTD MAKE ANY WARRANTY AS TO THE RESULTS THAT MAY BE OBTAINED FROM THE USE OF THE SERVICE OR THE ACCURACY OF ANY OTHER INFORMATION OBTAINED THROUGH THE SERVICE OR THAT DEFECTS IN THE SOFTWARE WILL BE CORRECTED. YOU UNDERSTAND AND AGREE THAT ANY MATERIAL AND/OR DATA DOWNLOADED OR OTHERWISE OBTAINED (INCLUDING SOFTWARE) THROUGH THE USE OF THE SERVICE IS DONE AT YOUR OWN RISK AND THAT YOU WILL BE SOLELY RESPONSIBLE FOR ANY DAMAGE TO YOUR COMPUTER SYSTEM OR LOSS OF DATA THAT RESULTS FROM THE DOWNLOAD OF SUCH MATERIAL AND/OR DATA. NO INFORMATION OR ADVICE, WHETHER ORAL OR WRITTEN, OBTAINED BY YOU FROM RCA RT PTY LTD OR THROUGH THE SERVICE SHALL CREATE ANY WARRANTY NOT EXPRESSLY MADE HEREIN. SOME JURISDICTIONS DO NOT ALLOW THE EXCLUSION OF CERTAIN WARRANTIES, SO SOME OF THE ABOVE EXCLUSIONS MAY NOT APPLY TO YOU. IN NO EVENT SHALL RCA RT PTY LTD BE LIABLE FOR ANY INDIRECT, INCIDENTAL, SPECIAL OR CONSEQUENTIAL DAMAGES, RESULTING FROM THE USE OR THE INABILITY TO USE THE SERVICE, INCLUDING, BUT NOT LIMITED TO, DAMAGES FOR LOSS OF PROFITS, EVEN IF RCA RT PTY LTD HAS BEEN ADVISED OF THE POSSIBILITY OF SUCH DAMAGES. RCA RT PTY LTD'S LIABILITY TO YOU OR ANY THIRD PARTY IS LIMITED TO $50. SOME JURISDICTIONS DO NOT ALLOW THE LIMITATION OR EXCLUSION OF LIABILITY FOR INCIDENTAL OR CONSEQUENTIAL DAMAGES SO SOME OF THE ABOVE LIMITATIONS MAY NOT APPLY TO YOU. or (c) any third-party claim, action or allegation brought against RCA Rt Pty Ltd arising out of or relating to a dispute between its users over the terms and conditions of a contract or related to the purchase and sale of any services. These Terms are governed in all respects by the laws of the State of Victoria in the Commonwealth of Australia as such laws are applied. Both parties submit to personal jurisdiction in Victoria and further agree that any cause of action relating to these Terms shall be brought in a court in Melbourne, Victoria. If any provision of this Agreement is held to be invalid or unenforceable, such provision shall be struck and the remaining provisions shall be enforced. RCA Rt Pty Ltd's failure to act with respect to a breach by You does not waive RCA Rt Pty Ltd's right to act with respect to subsequent or similar breaches. You may not assign or transfer this Agreement or any rights hereunder, and any attempt to the contrary is void. This Agreement shall inure to the benefit of and be binding upon each party's successors and assigns. RCA Rt Pty Ltd shall not be liable for any delay or failure to perform resulting directly or indirectly from any causes beyond RCA Rt Pty Ltd's reasonable control. Unless otherwise provided in this Agreement, any notice required or permitted to be given under this Agreement shall be delivered (i) by hand; (ii) by registered or certified mail, postage prepaid and return receipt requested to the address provided by the other party, or to such other address as a party may designate by written notice in accordance with this Section 12; (iii) by overnight courier or (iv) by electronic mail with confirming letter mailed under the conditions described in (ii). Notice so given shall be deemed effective when received, or if not received by reason of fault of addressee, when delivered. These Terms constitute the complete and exclusive understanding and agreement of the parties relating to the subject matter hereof and supersedes all prior understandings, proposals, agreements, negotiations and discussions between the parties, whether written or oral. You understand and agree that You are solely responsible for periodically reviewing the Terms of Service. You must report any violations of these Terms. To do so, send an email to bill.holmes@rca2go.com. * You are affiliated to a company that is a member of SIRF Roundtables or has expressed an interest in membership. * The focus of SIRF Roundtables is fundamentally on fostering Peer to Peer learning. Our key approach is to put practitioners into contact with other practitioners. We are a communication company and, in the modern world, emails are a key part of communication. We understand that companies that are members of SIRF Roundtables communicate electronically because they wish their personnel to enjoy opportunities to learn about best practice and communicate with other leading professionals. * We respect your time and attention by controlling the frequency of our mailings and we do our best to minimise inconvenience. If you believe you have received unwanted, unsolicited email sent via this system or purporting to be sent via this system, please forward a copy of that email with your comments to Bill Holmes at bill.holmes@rca2go.com. 2. How we protect your privacy? We will never share, sell, or rent individual personal information with anyone outside RCA Rt without your advance permission or unless ordered by a court of law. Information submitted to us is only available to personnel engaged by RCA RT Pty Ltd for purposes of contacting you or sending you emails based on your request for information, and to contracted service providers for purposes of providing services relating to our communications with you. information, such as time and date of a page being viewed, and a description of the page on which the Web Beacon resides (the URL). This policy was amended on January 2017.